This year sees US shipyard Westport celebrating its 50th birthday: 50 years like the 50 stars on the legendary “Old Glory”, America’s famous national flag better known worldwide as “the stars and stripes” for its unmistakable graphical layout. The celebrations for the half century of the shipyard, which is based in Washington State with a corporate identity proudly incorporating a red, white and blue “Made in the USA” logo, will include the traditional birthday cake, but also a gift fit for such an important event, in the form of a new series of luxury motor yachts, the Westport 3800 Series, presented last year – probably to the tune of the national anthem “The Star-Spangled Banner” as is usual on the grandest occasions. The new series is also known as the W 125 | 38 M Series, and it represents the innovative next generation of the shipyard’s product range, introduced with the presentation of the first model: the Westport 125 RPH (raised pilothouse). This new model was met with immediate acclaim, and the first hull is currently under construction at the shipyard’s facilities. These include three separate yards in Westport, Hoquiam and Port Angeles, all within the Seattle metropolitan area along the Pacific coast. As the renowned shipyard’s motto unequivocally states, the next generation is also “designed, engineered and hand built in America”, but it represents a substantial evolution in Westport’s production, which is turning an important corner to take on a role with considerable strategic and commercial importance on the world market. The new series has certainly been conceived with the typical modern American client in mind, but at the same time it also has an eye to a contemporary international clientele from Europe, the Middle East, Russia and China. After decades of experience and success in the shipbuilding sector achieved with highly developed technologies and the use of advanced composite fibreglass, Westport has further improved its construction system for the new W 3800 Series as well as optimising the structural engineering with the aim of increasing both performance at sea and operating efficiency, and providing more space on board both indoors and out. The build of the W 125 | 38 M Series therefore benefits from the latest production technologies: the hull, superstructure and decks are of foam-cored composite construction with E-glass reinforcements in vinylester resin; the core material and density varies throughout to optimise engineered structures, whereas the structural framing combines E-glass and carbon fibre reinforcements in vinylester resin. 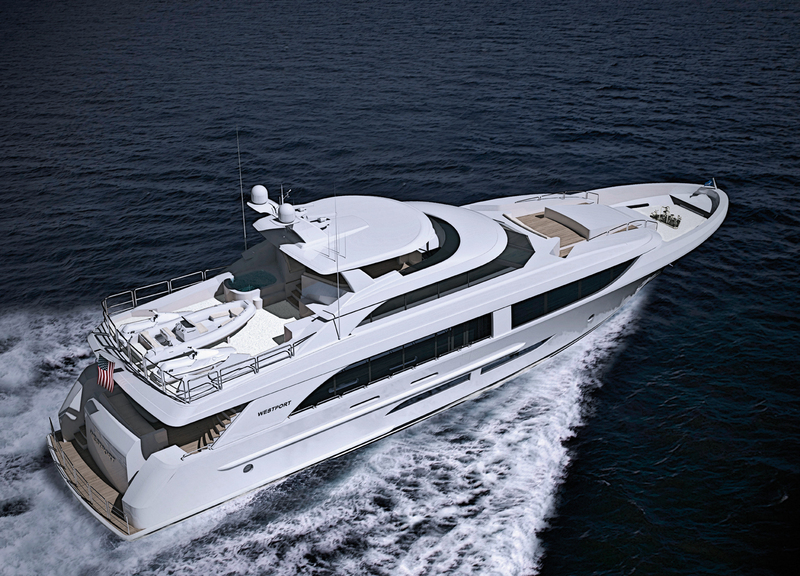 For the first hull, currently under construction, both the hull and the superstructure are finished in Alexseal “Snow White” high-gloss urethane paint. In terms of stability and comfort, Westport decided to adopt a sophisticated combined technical solution consisting of a gyro system and a system of fins and actuators. The gyro stabilisation system is electrically powered and consists of a pair of Seakeeper 35 gyroscopes installed in the corners of the lazarette, which act independently in “stabilisation at rest” mode, while in “stabilisation underway” mode the system supports the traditional Naiad 425 hydraulically powered stabilisation system consisting of a pair of 19 square foot active fins and their actuators, which are positioned to port and starboard amidships. Further technical solutions raise the level of comfort on board, such as the various solutions devised by the shipyard’s in-house team and external professional consultants to reduce vibrations and attenuate noise. In the engine room, both the engines and the generators are installed on supports made of a resilient material to absorb as much vibration as possible, and the engine room acoustic insulation is integrated within the fire insulation package, which consists of an aluminium plate reflective barrier, absorbent layers and structural damping materials. For the same reasons, the interior private and public spaces are produced using sound-tight construction techniques to prevent noise transmission between compartments, as well as floating joinery connections, acoustic insulation and damping materials to radically suppress the transmission of structure-borne noises and vibrations. The control and alarm systems also use first-rate technologies, thanks to VIC2, a proprietary Westport monitoring and alarm system that identifies and provides visibility to critical vessel functions and safety information on a single screen in the pilothouse. The system is based on a 24-volt redundant architecture to provide robust reliability, in both normal operation and emergency situations, and the hardware includes a dedicated network of human-machine interface (HMI) touchscreens, strategically located throughout the vessel to aid the crew in efficient alarm recognition. The audio and video electronics for on-board entertainment are also state-of-the-art, with each public area and guest accommodation space equipped with an LED LCD television screen and a Kaleidescape unit connected to the central movie and music server: a digital library and media content distribution system that provides a variety of entertainment sources throughout the yacht. 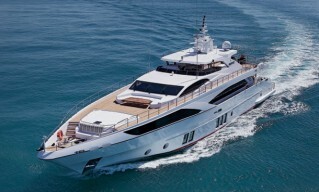 The general arrangement of the yacht benefits from the generous maximum beam, with the result that the new Westport 125 RPH has an interior layout designed to accommodate up to eight/ten passengers in three/four guest staterooms and one master stateroom, and up to five/six crew in two crew cabins and one captain’s cabin. On the flybridge, a hard top forward protects the external helm station and an open air lounge area for relaxation, while to aft the sunbathing area with a bar and Jacuzzi transforms when the yacht is moving into open air storage for two jetskis and a 15-foot RIB tender with outboard motor. The fore deck holds another open air lounge area and another sunbathing area with sun pads. The raised pilothouse is set out with two pilot’s chairs and an observation sofa for guests. On the main deck, to aft there is a veranda for al fresco dining with a bar, which is connected to the salon through sliding glass doors. The salon itself is subdivided into a living area and a dining area, while the galley is located amidships including a casual breakfast nook / dinette. A lobby with a day head leads to the full-beam owner’s suite occupying the forward section of the deck, which has his and hers bathrooms, his and hers wardrobes and a master stateroom with a king-size bed. Amidships on the lower deck, a lobby leads to the guest area, with four guest staterooms each with an en suite bathroom and a queen-size bed or twin beds. On request, one of the staterooms can be turned into an exercise room. Forward, the crew quarters comprise a crew mess and three cabins, each with its own bathroom: one captain’s cabin with a double berth and two crew cabins each with two foldout berths. To aft, the beach club faces out over the extendable swimming platform and has a bar and a shower / day head. In the interior design created to measure for the new Westport 125 RPH, the interiors benefit from both natural light and artificial light provided by LEDs (the latter are controlled by a system from Crestron). Both types of light throw the materials and finishes of the fittings into sharp relief, with their contemporary style incorporating decorative art elements chosen by the owner. The brief description below, provided to us directly by the US shipyard for publication here, summarises some of the types of materials and finishes used. For the joinery work: a rich red/brown tone hardwood of the mahogany family, the sapele, is used as the primary wood in public areas and guest accommodation spaces. Accent pieces display veneer work in sapele pommele, a cut of the sapele log showing a highly figured grain pattern. 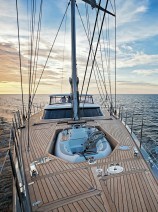 The crew areas are constructed using beech hardwoods and anigre veneers, providing a light finish tone. The joinery finish system employs a full epoxy grain fill to seal the wood and a polyurethane top coat; the finish sheen is primarily satin with high gloss accents on all selected trim pieces and tops. For the countertops: throughout the public areas and guest accommodation, countertops are wood with a high gloss finish or natural stone. Stone tops in the galley, guest and master heads, and on the buffet and bar cabinets are constructed using thin, lightweight slabs with full thickness bonded edge details. The crew galley and crew head and utility areas employ Corian solid surface tops. For the wall coverings: wall treatments are varied throughout the vessel to suit the décor theme of each space; finishes include wood panelling, upholstered panels, and directly applied decorative wall coverings. 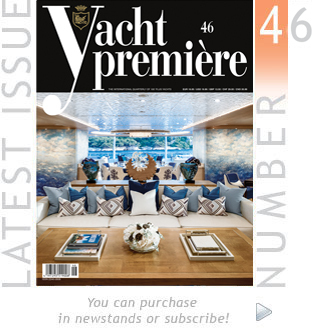 For the floors: natural stone, as selected by the interior designer, is used in the main deck entry area, the lower foyer and the guest and master heads; a fabric carpet is installed in the salon and dining area, pilothouse, guest and crew staterooms and the crew lounge.